The following diagram is meant to help you in identifying any problem you might have before you call our office. Band the ring of metal that is glued onto the tooth. Bonded Bracket the attachment bonded directly to the tooth. Bracket the bracket part that is attached to the band. Archwire the removable wire that fits along the outside, into the bracket slots. Wire Ligature a tiny wire that holds the archwire into the bracket. Elastic Ligature small rubber "rings" that hold the archwire into the bracket. Hooks where you attach elastics (rubber bands). Head Gear Tube tube on the upper molars where a headgear fits. 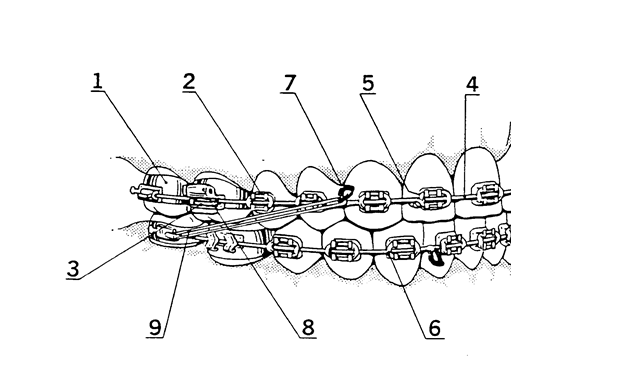 Click here for more information about these and other parts of braces. Click here to see how your braces might look with different colours.